Designed to do one thing and to do it well: contain material at the transfer points on your belt line. Extra-rugged reinforced design with 1/4″ steel insert. Available in either polyurethane only or with ceramics. All containment skirting comes with polyurethane Snap-Tite plugs which cover the mounting slots in the skirting and prevent material build-up. 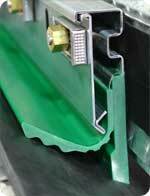 Polyurethane skirt is available with either a straight or 20° beveled edge, in 60″ and 96″ lengths. Varying heights and thicknesses available. Ceramic-embedded skirting is available with flat, 20° or 35° beveled edge, in lengths of 48″ or 60″. The 1″ thick skirt uses hextiles and the 2″ thick uses cubes. Argonics’ KS01 urethane skirting started the trend toward urethane as a skirtboard solution. KS01 skirting fits into any other manufacturers’ existing skirtboard clamping systems on the market today, as well as Argonics’ own Wedge-Loc clamp, making it a snap to replace your old skirts. Snap-Loc is the standard for dust containment skirting. This straightforward, no-nonsense design for dust control snaps into standard unistrut railing that can be bolted or welded into place. The Duo Seal is the newest skirting offering from Argonics. 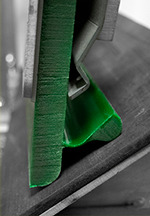 Its 100% urethane construction fits into most manufacturers’ clamping systems, including our Wedge-Loc clamp. 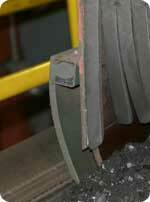 The Duo Seal’s flexible secondary seal conforms to the belt and keeps dust and material under control. 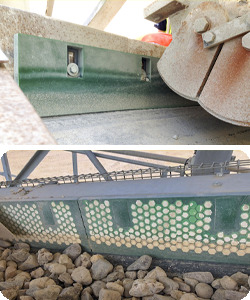 Its compact, smaller footprint requires less belt on the outside of the conveyor in order to install it. Fold-n-Seal gives you the best of both worlds: material and dust containment in one unique solution. The primary seal keeps the material where it should be – on the belt. 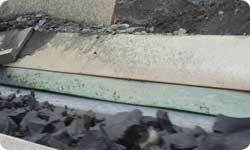 The secondary seal keeps dust and particulate material under control. Fold-n-Seal is available with Argonics’ easy-to-use Wedge-Loc clamping system and is designed to work with almost all existing skirtboard clamping systems on the market. 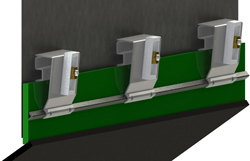 Wedge-Loc is designed to be easy to install and adjust. Simply stitch weld or bolt into place, install your skirting, drop it to the belt, then knock the wedges to lock it down. Use Wedge-Loc to replace your old busted or worn-out clamping systems and install your choice of skirting: Fold-n-Seal or KS01. The Wedge-Loc frame is made of 12-gauge galvanized steel and the clamping utilizes a stainless steel-to-brass thread contact, coupled with a cast aluminum wedge to ensure continuous operation in the most corrosive and abusive environments. Argonics Conveyor Belt Skirting Systems are protected by one or more of the following patents: 6,547,062; 7,484,617.